Let the inner circle’s radius equal r1. Given the geometry of the square, the radius of the outer circle must equal r1*√2 (since that is the distance from the center point of the square to its vertices). Thus, the middle circle must have a radius of the average of the two other circles, r1*(1+√2)/2. The height of the octagon is twice this value, r(1+2^.5). Let the value of an edge of the octagon be some value s. In terms of s, the height of the octagon is s + s/√2 + s/√2, or s(1+√2). By setting this value for the octagons height equal to the original expression of the octagon’s height, we can relate r to s: r(1+2^.5) = s(1+2^.5). 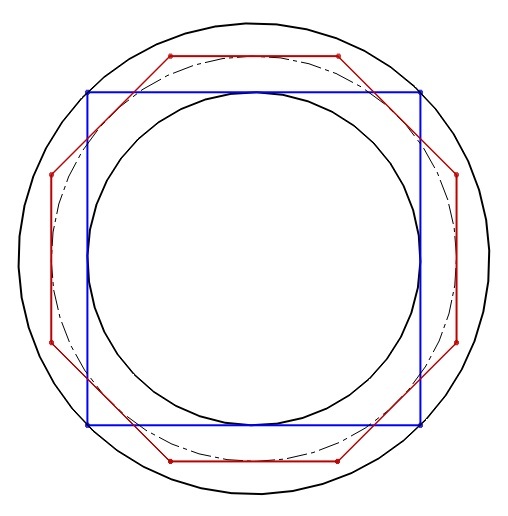 Thus, r = s.
Since the edge length of the square is 2*r, its perimeter is 4 times this value, or 8*r. The perimeter of the octagon is simply 8*s. Since r = s, these are the same quantities. Neither perimeter is larger.